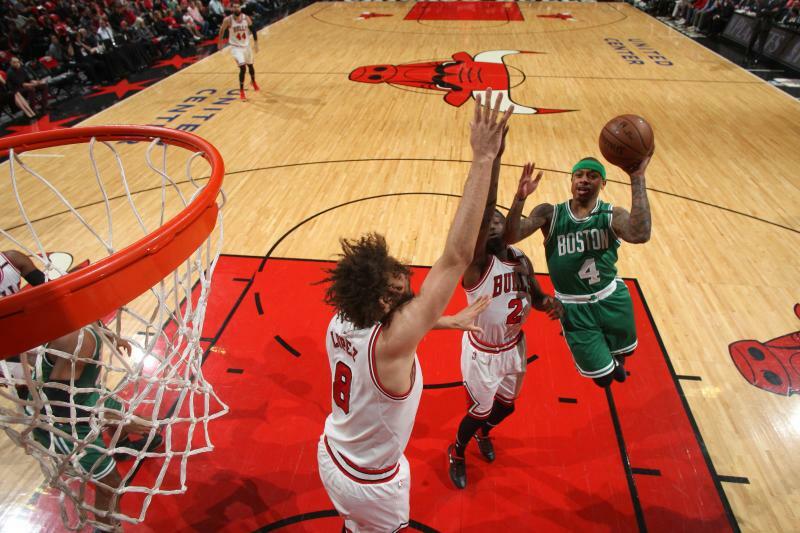 The Boston Celtics triumphant 104-87 victory over the Chicago Bulls can be summed up in two headlines. As all dedicated Celtics fans know, Rajon Rondo, at his zenith, is as well-rounded as a serviceable point guard could possibly be, and his experience was critical in the Bulls first two wins. Not only was his length paramount in defending Isaiah Thomas in the pick ‘n roll, but his ability to rebound amongst a crowd and push it up the floor gave Chicago a discernable tempo that burned a staggered Celtics team – desperately trying to match Chicago’s size. Without Rondo, the Bulls’ offense lost that degree explosion in transition, forcing themselves into a half court game against an even better half court defense. This one may seem insignificant, considering Gerald Green had eight points on 3 of 8 shooting, but Coach Stevens’ installing Green in the starting lineup was instrumental in the Celtics success. The Celtics most glaring weakness entering game No. 3 was rebounding, lacking the size to ward off the likes of Robin Lopez. So instead of desperately trying to match the Bulls size, coach Stevens opted to go small, and recapture their break-neck tempo and three point accuracy. Will the Celtics carry their small lineup’s momentum into game No. 4, or will they make further adjustments to keep the Bulls on their toes? Game 4 kicks off Sunday night at 6:30 p.m.